Looking for something to do in Atlanta this Thursday? Consider Cocktails in the Garden at the Atlanta Botanical Gardens from 6 to 10 p.m. with “the most beautiful cocktail party in the city”. 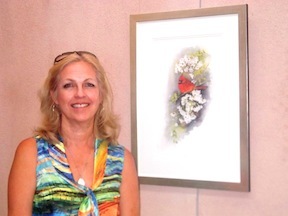 Be sure to visit the Fuqua Orchid Center Art Gallery for the opening of Beth Evans Watercolors to enjoy a collection of lovely paintings inspired by the colors, textures and habitats of birds. A true Southern native, the artist is originally from Montgomery, Ala. She earned her fine art degree from Auburn University, and now resides in Metro Atlanta. Beth’s work focuses on Southeastern birds in their local habitats. She draws her inspiration from the wide range of flora and fauna of her southern surroundings. Cocktails in the Garden features a full cash bar, live music, and hors d’oeuvres from top Atlanta restaurants. Guest admission to the gardens is $18.95. To purchase artwork by Beth, please visit the Garden Gift Shop. A portion of the proceeds from the sale of artwork benefits the Atlanta Botanical Garden. “Beth Evans Watercolors” will be on display June 23 – August 1, the gardens are open Tuesday through Sunday, 9am- 7pm.